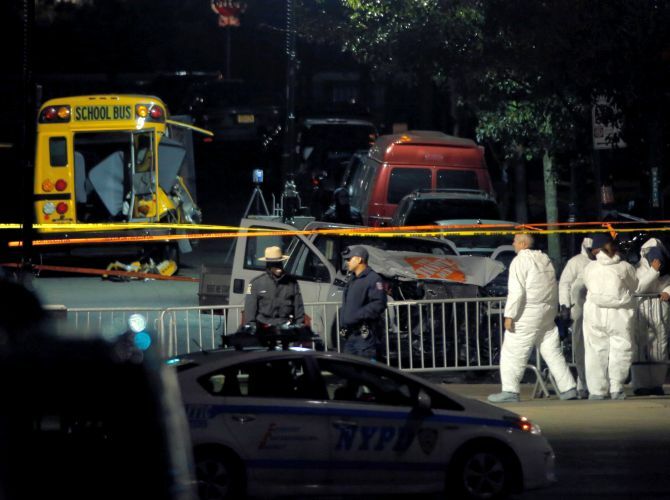 A domestically radicalised Uzbek man yelling 'God is great' ploughed a pickup truck down a crowded bicycle path in New York, killing eight people and injuring 11 others in the deadliest terror attack on the city since 9/11. The 29-year-old suspect, a sympathiser of the Islamic State terror group, was shot in the stomach by a police officer before being arrested. The Uzbek man has been identified as Sayfullo Habibullaevic Saipov, an immigrant from the Central Asian country, who came to the US legally in 2010. 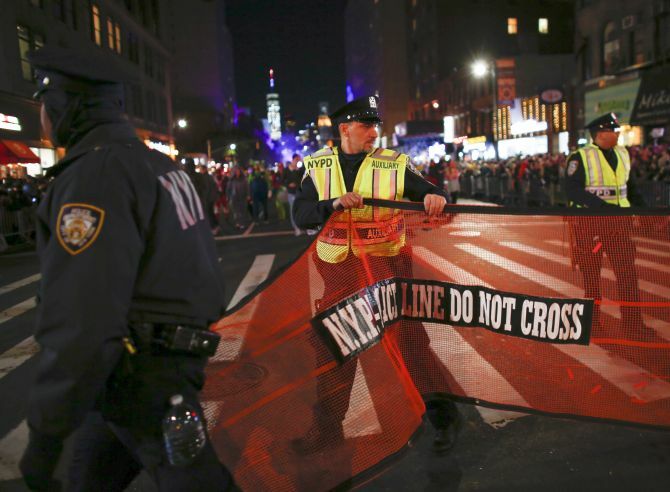 The incident took place near the World Trade Centre and along the normally gridlocked West Side Highway, a major thoroughfare that runs along the western edge of Manhattan by the Hudson River as Americans celebrated Halloween. The attacker left nearly a half km crime scene -- a tree-lined bike path strewn with mangled bicycles and their parts. What we know of the attacker? >> Saipov was an Uzbekistan native who had lived in the US for seven years, ran two trucking companies and was a ‘friendly’ Uber driver, sources claim. >> He was reportedly found with a Florida ID when arrested, he had lived most recently in New Jersey, and ran two trucking companies located in Ohio. >> Saipov has a minor criminal record for traffic offenses in Missouri and Pennsylvania. Police said the truck drove south after entering a pedestrian and bicycle path, where it struck multiple people. Six men were pronounced dead at the scene on the cycle lane and two other people were dead on arrival at the hospital. The victims included five Argentinians and a Belgian citizen. Two other victims have not yet been identified. After smashing the truck into a school bus, injuring two adults and two children, the suspect exited the truck displaying "imitation firearms" and was shot by police, according to the New York Police Department. Officers were able to talk to Saipov before the surgery, but it was unclear if he told them anything, a law enforcement official said. New York Governor Andrew Cuomo said Saipov was "radicalised domestically" in the US. 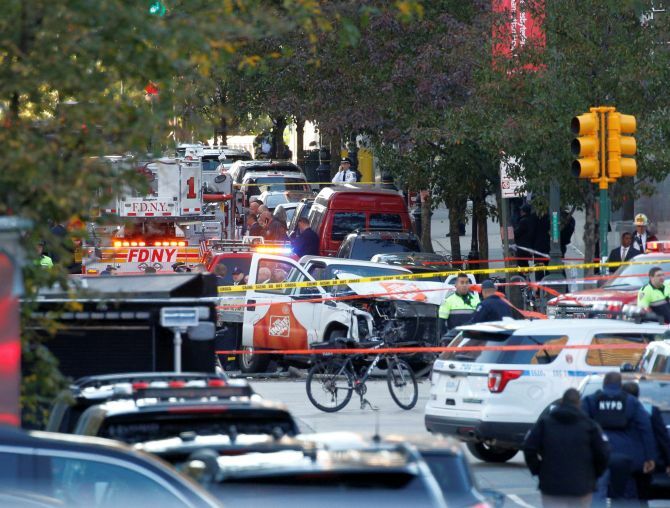 IMAGE: A Home Depot truck which struck down multiple people on a bike path, killing several and injuring numerous others is seen as New York city first responders are at the crime scene. "The evidence shows -- and again, it's only several hours, and the investigation is ongoing -- but that after he came to the United States is when he started to become informed about ISIS and radical Islamic tactics," Cuomo told CNN. "We have no evidence yet of associations or a continuing plot or associated plots, and our only evidence to date is that this was an isolated incident that he himself performed," he said. Officials said Saipov left a note declaring his allegiance to the Islamic State, but authorities have not found any connections between him and the terror group or any other organisation. One witness, Eugene Duffy, told ABC Channel 7 that he saw the truck driving quickly down the cycle path alongside the West Side Highway at full speed as it hit a number of people. He also reported hearing about nine or 10 shots. 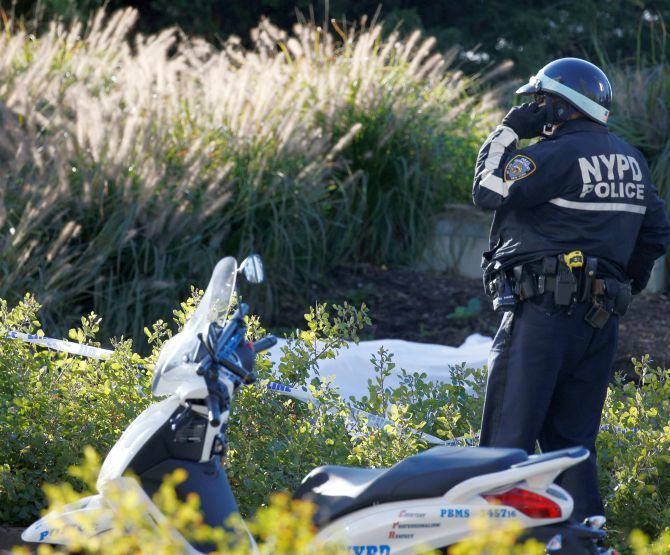 The driver shouted 'Allahu Akbar' (God is great) after getting out of the vehicle, New York Post reported. A pellet gun and a paintball gun were recovered from the scene, officials said. Eleven people were transported to the hospital with serious but non-life-threatening injuries, according to New York Fire Commissioner Daniel Nigro. 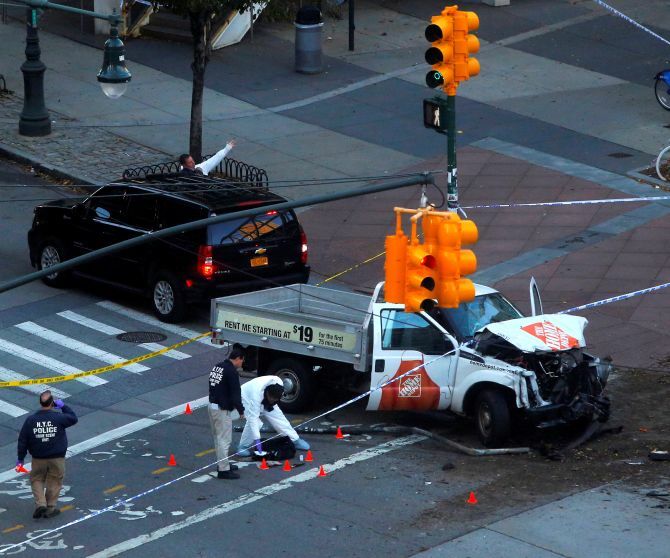 A spokesman for Home Depot confirmed one of the company's rental trucks was part of an incident in lower Manhattan and said the company is "cooperating with authorities" in the investigation. The suspect, who hails from Paterson New Jersey, had multiple interactions with law enforcement in several states, online records show. Saipov had traffic citations issued in Missouri and Pennsylvania. New York City mayor Bill de Blasio said the incident was being treated as an act of terror, "a particularly cowardly act of terror". US President Donald Trump denounced the attack, saying "we must not allow ISIS to return". 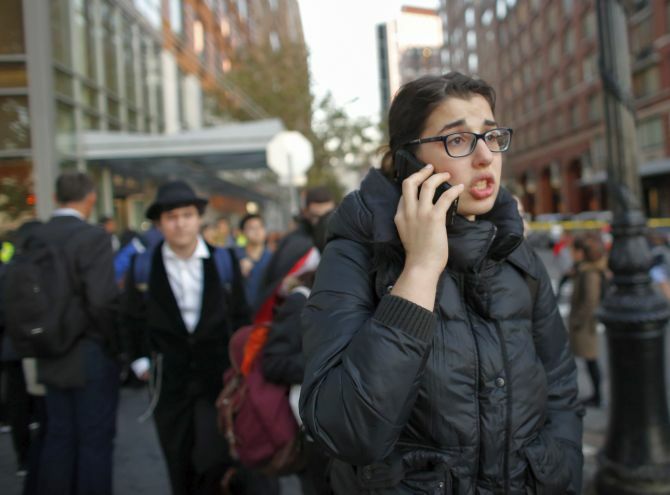 "In NYC, looks like another attack by a very sick and deranged person. Law enforcement is following this closely. NOT IN THE U.S.A.!" Trump tweeted. Trump also said he had ordered more robust "extreme vetting" of travellers coming into the US. The US Justice Department said in a statement that a joint terrorism task force that included the FBI, the NYPD and others was investigating the attack. Among those killed were five Argentinians in New York for a class of 1987 school reunion, according to the Argentine government. They were named as Ariel Erlij, Hernán Diego Mendoza, Diego Enrique Angelini, Alejandro Damián Pagnucco and Hernán Ferruchi. “The compatriots, from the city of Rosario, were part of a group of friends celebrating the 30th anniversary of their graduation from the polytechnic school of that city when the tragic event occurred,” it continued. Also among the dead was one Belgian, Didier Reynders, deputy prime minister and foreign affairs minister for Belgium, confirmed. Three other Belgians were among the wounded. “I am deeply saddened to announce a Belgian victim in Manhattan,” Reynders tweeted. “I express my condolences to the family and friends. An Uber spokeswoman said Saipov also drove for the ride sharing-company, which is cooperating with authorities. The One World Trade Center, the main building of the rebuilt World Trade Center complex destroyed during the September 11, 2001 terror attack, was lit in red, white and blue in honour of freedom and democracy. New York has been largely spared from terrorism since nearly 3,000 people were killed in the 9/11 attack. The most recent violence from terrorism there came in September 2016, when a man set off shrapnel-packed explosives in the Chelsea neighbourhood of Manhattan. Nobody was killed, but 30 people were injured in the incident. Trucks have become a common weapon for terrorists in recent years, with the ISIS encouraging its followers to use them in carrying out deadly attacks. In July 2016, an assailant influenced by the Islamic State drove a 19-tonne cargo truck into a crowd in the French city of Nice, leaving 86 people dead and 434 injured. In December, a man with ties to Islamic State drove a 27-tonne truck into a Christmas market in Berlin, killing 12 people and injuring 56 others.